BURNMASTER HAWK, PEN & 10-TIPS SET. By Mastercarver® High-performance tools! This affordable set has all the essentials needed for quality wood burning. This set includes the Burnmaster® Hawk 1-Port wood-burning power supply, pen patch cord/adapter set plus the Burnmaster® wood burning pen and full selection of 10-burning tips. For more details about Burnmaster® Hawk, Pen and Tips supplied in the set see below. 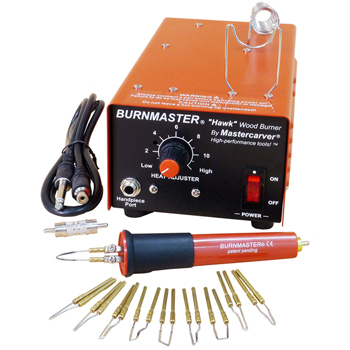 The Burnmaster® Hawk 1-Port wood-burning power supply: Imagine a top quality wood burning system that accepts any pen (handpiece) regardless of manufacturer & has up to 130 watts of power! It's not a dream, it's the Burnmaster! The advanced design of the amazing Burnmaster is so superior it's revolutionary! Unlike others, it accepts all major pen connection systems! So instead of being forced to use just one pen brand or buying adapters, you can choose & use virtually any pen. The Burnmaster accepts wood burning pens by Leisure Time Prod. (Detail Master), Colwood (Detailer), SMC / PJL, (Optima), Nibs, Navesink, Razertip & others with similar connections. Burnmaster controllers feature pro quality components, 130-watts max, transformer, precise variable power supply (now with micro heat adjustment), custom designed circuitry, reset fuse protection, all-metal housing (3.5" x 4.75" x 8.5"), non-slip rubber feet, 6' power cord, manual & 2-year warranty on Machine one year oh Handpiece . Weight: 4.5 lbs. Compare, quality, features & value, you'll prefer Burnmaster or your money back! 1. Unlimited creativity: pen accepts replaceable hot wire tips from Burnmaster®, Detail Master (Ver.I & II), Colwood & Razertip. 2. It connects directly to these brands of power supplies & pen patch cords: Burnmaster®, Colwood, PJL (Optima), Nibs & Razertip (adapter included). For connection to a Detail Master brand supply order optional #499000 pen patch cord (listed separately). 3. Adjustable tip extension (Burnmaster & Detail Master tips only), for deep reach, user comfort & control. 4. Ergonomic, self-aligning pen design, puts tip in the same position every time! 5. Screw posts ensure positive electrical contact pressure & with use remove performance-robbing micro corrosion. 6. Gold & copper contacts ensure superior electrical conductivity & performance. Razertip adapter included. 5-3/8". USA BURNMASTER® REPLACEABLE BURNING TIPS have several important benefits. Each tip is carefully shaped from advanced alloy tip wire and features precision made copper contacts for superior electrical conductivity. The selection includes the most useful, popular and time-proven shapes. These tip shapes are ideal for most projects, including detailing and texturing wood carvings, flat burning, gourd art and more! We sell this unit as we believe it to be the best I have used and abused mine for 15 years remember you get what you pay for! Warranties: 3-year power supply, 1-year pen, plus 30-day money back guarantee. I bought one of these off Terry a few months ago, and it is everything he said it would be. I have done basic pyrography before and alwasy struggled with heat settings and getting just the right amount of 'burn' to control depth, colour and speed. With the Burnmaster its all at your fingertips with the easy to set temperature dial. The tips that come with the machine are possibly all that one would need to do even the most detailed of designs. My customers rave about the fine detail I achieve with this tool. Click the button below to add the BURNMASTER HAWK, Pen & 10-Tips Set 499231 to your wish list.